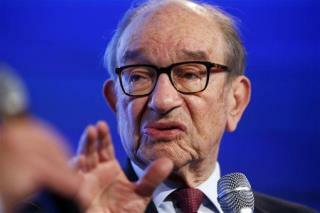 (Newser) – More than 20 years ago, Alan Greenspan uttered two words he'd become famous for: "irrational exuberance," which he used to warn about asset prices in the general investment market and how predicting the bursting of such bubbles was a challenging game. Now the former Federal Reserve chair is referring back to that same concept to describe a more specific, current phenomenon: that of "abnormally low" interest rates and a bond market on the brink of collapse, per CNBC, which notes the benchmark rate was pulled back to almost zero during the financial crisis and then kept there for seven years. (The Fed has since raised rates four times since 2015, but government bond yields are still lacking.) "There's only one direction in which [interest rates] can go, and when they start they will be rather rapid," he said Friday on CNBC's Squawk Box. After trump was forced to sign the sanctions ,made up by anti-American Globalist war mongers like McCain, Russia will retaliate by refusing the dollar. Also I am sure Iran ,Syria , Iraq ,China , Yemen , Philippines , Venezuela ,Bolivia , Brazil , Columbia and others will join.... The Globalists open borders ,One World Order cronies are going to destroy America. The last time that this old fart opened his mouth I lost over 100,000.00 in my PSP. He should just die so nobody else has to endure what we did. The buble is obviously in the student loan. Coz job isnt paying well anymore. A lot of traditional jobs is gone. Coz of efficiency. Human is not efficient anymore. Robot is. So how can these newly graduated student with a lot of debt and old skill can get a job that pay well so they can pay the loan back? Last time i check thats not going so well. You dont need to google it. You can feel it if youre a student yourself.